Hill House lies a little to the south of the town of Dunfermline in the County of Fife. The name Hill is possibly a shortening of Windmillhill which is on record from circa 1531 and which was somewhere in that vicinity. Indeed the remains of a windmill are still said to be visible to the south of Hill House. The lands of Hill were acquired by William Monteith of Randieford in 1621 and he received a charter for them in 1624. The date of 1623 along with his initials of WM below the front window suggest that he had built, (or possibly re–structured) the current building by that date. 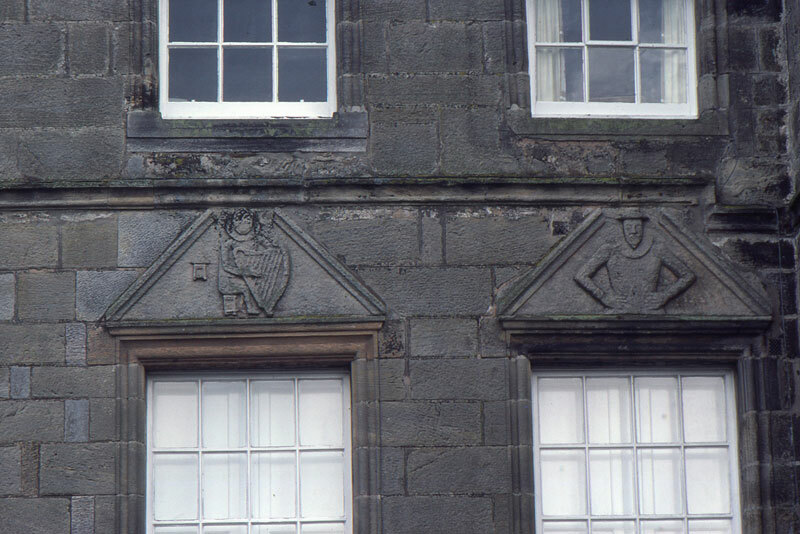 Windows at Hill House; on the left the harper carving on the pediment, on the right a male figure in early 17th century dress. Photograph by K Sanger, copyright WireStrungharp.com. William Monteith (or Menteith), was a church elder and a pious man as reflected in a number of Biblical inscriptions in Latin and Hebrew incorporated in the buildings facade. Two of the window pediments in the main block show male figures in early seventeenth century dress. In one the top half of a bearded figure is shown with hands on hips, while the other has a similarly dressed figure but shown playing a harp. The one with the harper also has a small building in the background which is probably intended to represent Hill House and the figures are possibly of William Monteith himself, albeit the presence of the harp adding a nod to the Biblical figure of King David. Closer view of the Harper window pediment at Hill House. 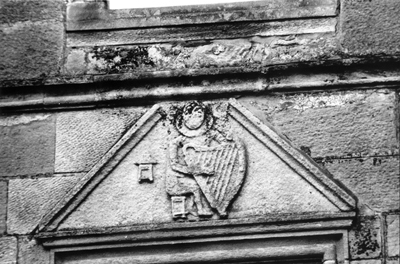 Although the harp had fallen out of favour at the court of James VI, and that court had in any case relocated to England when James acceded to the English Crown in 1603, both wire and gut strung harps continued to be patronised by the upper end of Scottish society through the first half of the 17th century. It is therefore difficult to catagorically assign the instrument shown on the window pediment to being either a wirestrung or gut strung harp as it seems to have elements of both.